Spring is a season of beauty, with its days alternating clear skies, showers, wind, light rain. Every now and then we complain about fluctuating temperatures (you never know what to wear, right?) But in return this weather alternation gives us interesting light, skies and colors, well worth a picture or two. 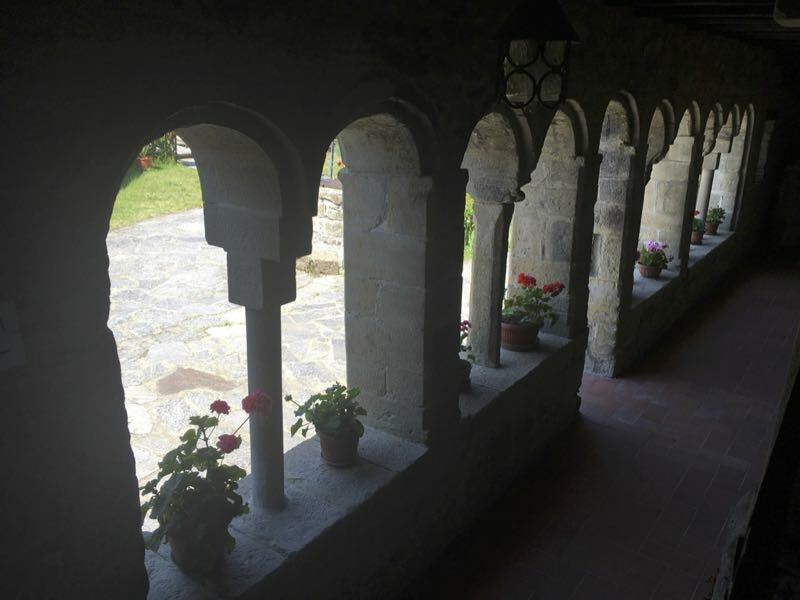 On an end-April Sunday we take advantage of one of the clear days to take a short drive not far from Oltrella and visit the most interesting place in Oltrepò Pavese, the Abbey of Sant’Alberto di Butrio. 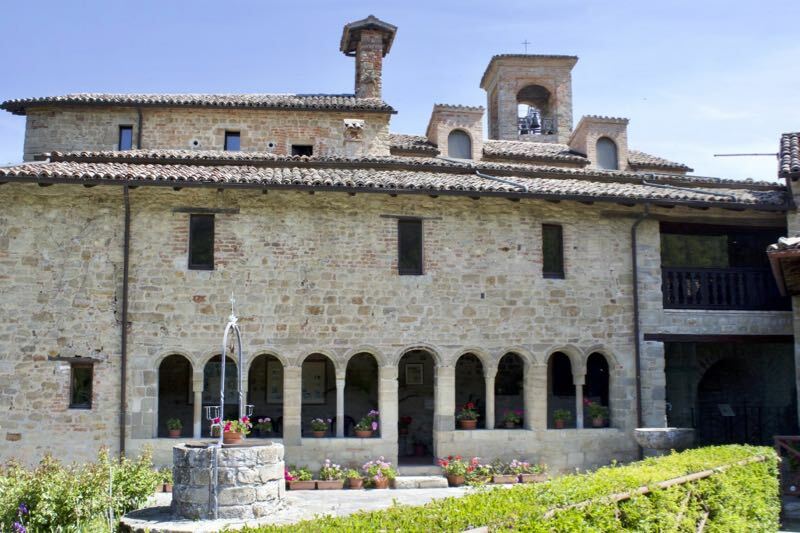 The Abbey is actually an ancient hermitage and is only a few kilometers from Oltrella. To enjoy the sunny day we extend a little bit the itinerary, descending to the SS461 and reaching the center of Ponte Nizza. From here, just before the mini market “F.lli Rossi” (a place to go in the area for typical and quality food) we turn right to the SP 7 of the Val di Nizza. The road mildly rises in an open, green landscape. At Casa Minchino we drive past Osteria La Piola. After about 2.5 Km we leave the SP 7 following the signpost for S. Alberto / Pizzocorno. The road gets narrower and rises between meadows, vineyards and orchards, which soon are replaced by chestnut woods. Suddenly on the left we are surprised by the view of the village of Moglie, which from here appears almost carved into the side of the hill. The clear day gives us saturated colors that put us in a good mood. We continue immersed in the green of the woods. No scare though, even in our wandering the signposts for Sant’Alberto are always present. We reach Pizzocorno, drive past the Oranami Farm with its organic produce, leave the village in the direction of S. Aberto and, in a few kilometers (and a few junctions) we can see the profile of the Abbey on the left, among the green of the woods. Here we are. Parking is easy near the Abbey. We leave the car and notice that one side of the parking lot is flanked by a shaded area with wooden tables and benches, ideal for a picnic. The simple furnishing inspires an idea for the future: setting up a beer garden with a view of the valley … we continue to dream while our beautiful country house is still work in progress! The space in front of the Abbey is dominated by the massive and square bell tower. On the right of the tower is a building with a porch, from which we enter the Abbey. Going down a few steps we find ourselves directly in a church (S. Antonio), a square room with a central pillar, of modest size but completely frescoed. 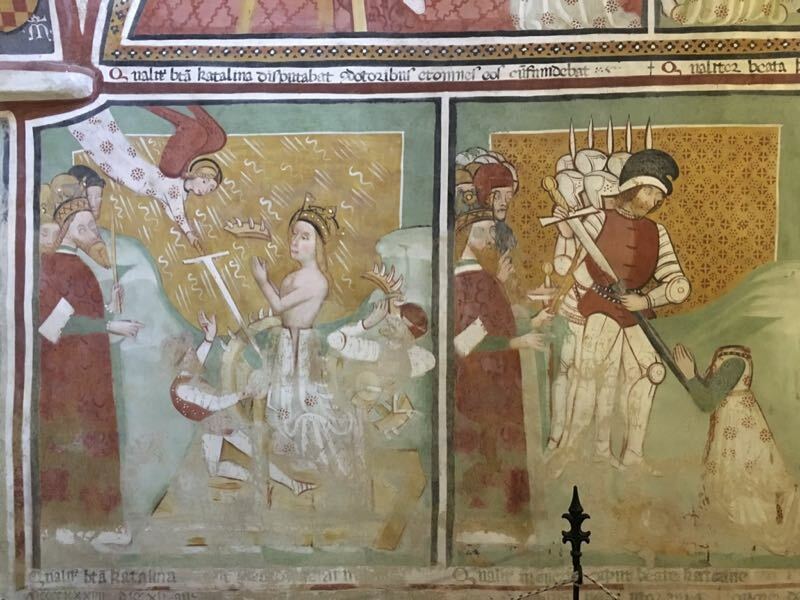 The fifteenth-century frescoes have a simple, no-frill style, far from the pomp of the sacred works of the great masters and suited to the rural environment in which the Abbey is immersed. Very nice indeed. On the left there is a second, smaller church (St. Mary, the oldest church), whose stone-faced walls are missing decorations. Only a stained glass separates it from the first frescoed church. From the first two churches you enter, through a doorway, to what seems like a short corridor but in fact is the third church of the complex, dedicated to Sant’Alberto. 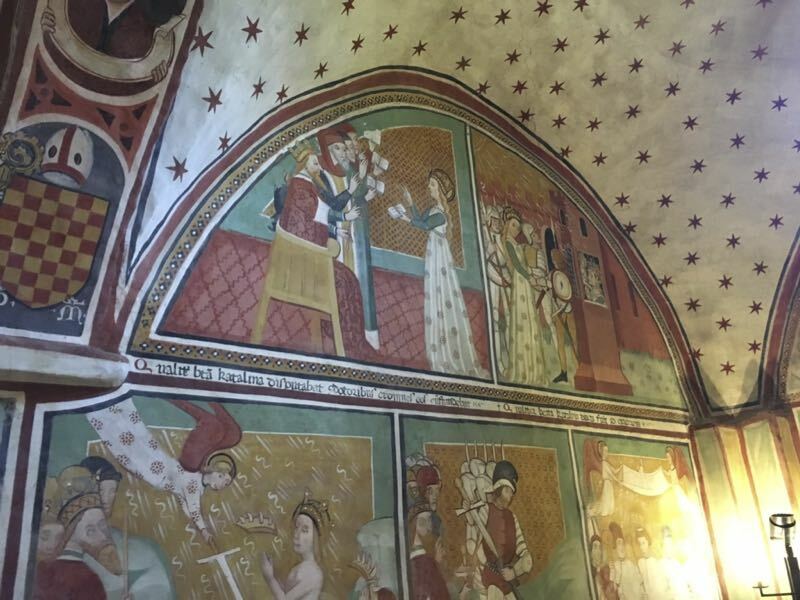 In the church, partially frescoed, we find the tomb of the Saint (marked behind the altar); his relics are preserved in a showcase decorated with a wax statue. In the corridor-church is a passage on the right which leads down a few steps to what remains of the original cloister: a shady and pleasant open gallery, adorned with plants and flowers. Going upstairs you enter the room where one of the protagonists of the spiritual rebirth of the Abbey, Frate Ave Maria, resided. In the gallery, below an archway, there is a grave carved in the rock where, according to local tradition, was buried no less than Edward II king of England. A plaque explains that tradition has found evidence in historical documents and correspondence: the king, who according to official historians was murdered in England by order of his wife, actually succeeded in fleeing and, after travelling half Europe, retired in the hermitage of Sant’Alberto and here he lived his last years. The Italian-British research team who is aiming to rewrite the history of England is obviously encountering a few obstacles by official British historians … and obviously this affair intrigues us a lot and we will try to find out more. From the open gallery you enter the garden, originally part of the cloister, full of blooming roses, irises and other hundreds colorful flowers. 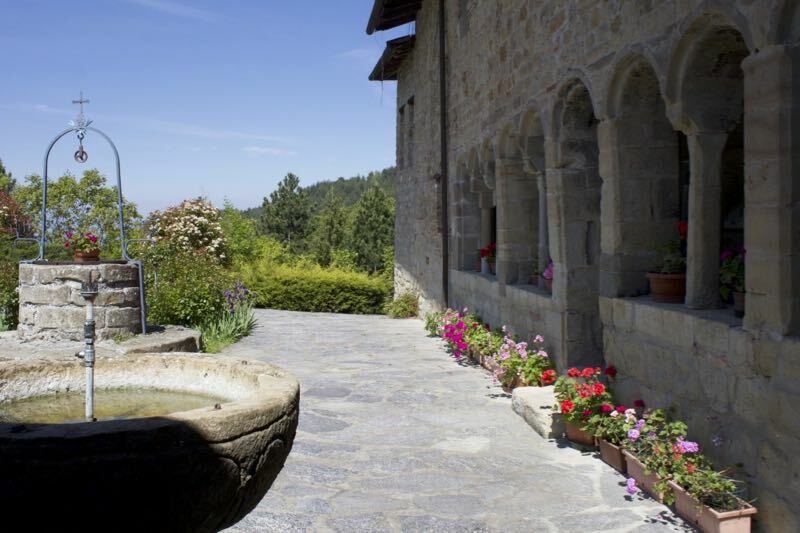 From the garden you access the modern panoramic terrace overlooking the monastic lodgings. In these places of peace and quiet you can stroll and stare, the view spanning the hills of the Nizza Valley and the Staffora Valley, and on clear days to the Alps. Or, below, you can take a peek at the vegetable garden and the hives from which the hermits get honey, essences, cosmetics and natural medicines sold in the Abbey shop. The shop can also be reached from the open gallery and is indicated by the sign “RICORDINI”. In Italy we have not been using this word for decades now, and replaced it with the more international word “souvenir”. The view of this unfashionable word makes us smile with tenderness. Who ever uses the word Ricordini for a souvenir shop? Of course we won’t miss a visit to the shop. One of the two friars at the counter is crocheting. We browse the shelves and, among ointments and herbal teas, we choose a natural mint soap, which we can not wait to try. From the churches to the cloister to the garden, even in the souvenir shop, the aura of silence and peace is palpable everywhere. The stone walls and the articulated composition of the buildings reveal the antiquity of the Abbey (it dates back to the 11th century!) and compel respect. The Abbey was of great prestige throughout the Middle Ages but was abandoned for three centuries, and then returned to life in the twentieth century. We are grateful to those patrons who, after centuries of abandonment, wanted to save such a beauty from the damage of time. 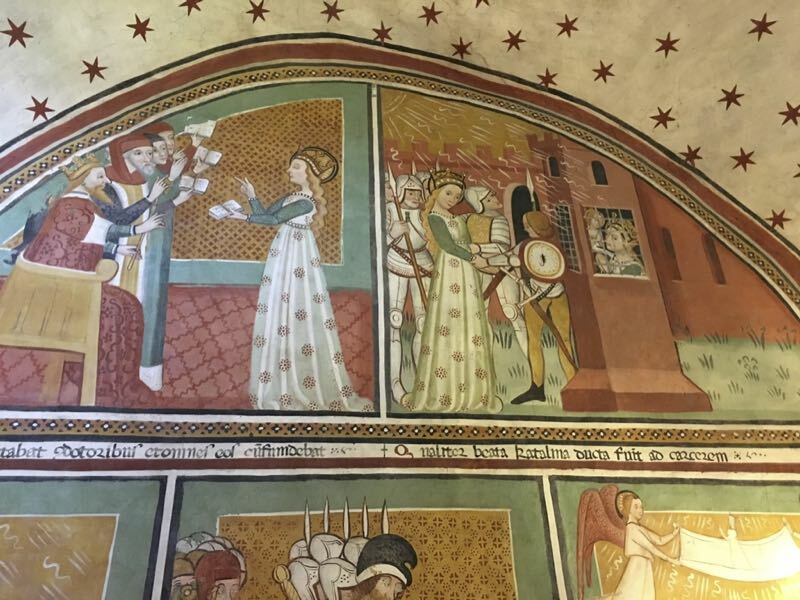 In this case, our patron is called Don Orione, which is remembered and honored at various points in the Abbey. The Abbey of Sant’Alberto di Butrio is one of the few monuments in Oltrepò Pavese worthy of a brief mention in the tourist guides. Beyond the artistic interest, the hermitage is a tiny jewel and is also recommended as a day-long trip from Milan. The Abbey of Sant’Alberto di Butrio, […] m. 682, a famous and powerful time and today evocative witness to the medieval monastic spirit. Founded by the Hermit Alberto and the Malaspina in the XI century, already mentioned in 1073 by Gregory VII in a papal bull, it reached the highest splendor in the XII – XIV centuries, but already around the middle of the 16th century was reduced and was finally suppressed in 1810. It is preceded by a mighty square tower, the rest of a fortified enclosure, sided by the sacristy which is engraved on the complex made up of two churches: S. Antonio, with a central frescoed pillar of 1484, and S. Maria, the smallest, alongside a third church dedicated to St. Alberto. The latter contains the relics of the saint and some frescoes of the ‘400 expressing intense popular religiousness; Among them: Virgin, saints and Bertramino Malaspina, the miracle of St. Alberto at the papal court, Portrait of Emperor (perhaps Sigismund of Luxembourg, 1433-37). In addition, the church descends to the remains of the cloister (14th c.) And the porch leading to the monastery.